And there's more bad news, grown-ups: The authors of two new parenting books believe you're part of the problem. 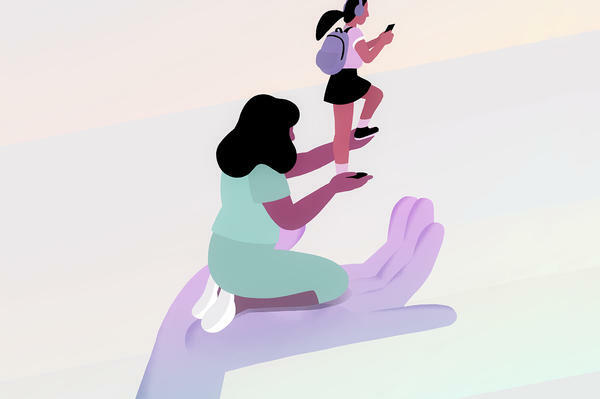 "Kids are play-deprived nowadays," says Katherine Reynolds Lewis, a journalist, parent, parent-educator and the author of one of those two new books, The Good News About Bad Behavior. And by "play" she means play without screens or adults keeping watch. "Two or three decades ago, children were roaming neighborhoods in mixed-age groups, playing pretty unsupervised," Lewis says. And this kind of parent-free play helped them develop important skills they'd use for the rest of their lives. "They were able to resolve disputes. They planned their time. They managed their games. They had a lot of autonomy, which also feeds self-esteem and mental health." These days, though, free play is on the decline, Lewis says, and so are the social and emotional skills that come with it. Part of the problem, according to Lewis, is parents who worry that unsupervised play is just too risky. But the risk is part of the point — for kids "to have falls and scrapes and tumbles and discover that they're okay. They can survive being hurt." In many families, Lewis says, play has also been crowded out by parents' increased focus on schoolwork. William Stixrud is not one of those parents. "When my kids were in elementary school, I said, 'You know, I'm happy to look at your report card, but I don't care that much. I care much more that you work hard to develop yourself,'" says Stixrud, a neuropsychologist and co-author of the other new parenting book, The Self-Driven Child. He says academics are important, but that, in most cases, kids should be in the driver's seat, learning to manage their work, their time and, ideally, being able to pursue their own interests. That freedom, Stixrud says, helps them develop internal motivation in a way that rewards and grades just can't. Stixrud's daughter, Jora LaFontaine, who now has a Ph.D. in economics, says she still remembers first grade, when she brought a paper home from school. Her parents were supposed to sign it every day, proving she'd read for fifteen minutes. The first day, though, Jora says her father looked at it, laughed, "signed every single line on it and said that he did not want to turn reading into homework or a chore." When she was an A student in high school, Jora attended a talk her dad gave about why parents shouldn't focus on grades. William Stixrud remembers his daughter pushing back that night in the car. "Driving home she said, 'You know, I liked the lecture, but I don't really believe that you believe that stuff about the grades," Stixrud remembers. "Most people I tell this to laugh," Jora says, laughing herself. "So, I said to my dad, 'If you don't get [good] grades, you're not gonna get into college. Or at least you won't get into a good college." "So my dad said, 'I will give you a hundred dollars if you're willing to get a C in one of your classes,'" Jora says. Stixrud says, his daughter already took school seriously, and he wanted her to understand that "one thing that seems like a disaster is just not that big a deal." As Lewis writes, "to build self-control, we need to stop controlling children." Rates of anxiety and depression have been rising for years, and experts say, grown-ups, you guys are part of the problem. But here's NPR's Cory Turner with some good news. CORY TURNER, BYLINE: Grown-ups can be part of the solution, too. KATHERINE REYNOLDS LEWIS: Kids are play-deprived nowadays. TURNER: Katherine Reynolds Lewis is a journalist, parent, parent educator and the author of one of those two new books. It's called "The Good News About Bad Behavior." LEWIS: Two or three decades ago, children were roaming neighborhoods in mixed age groups playing pretty unsupervised. SEAN ASTIN: (As Mikey Walsh) Our parents, they want the bestest (ph) stuff for us. TURNER: The 1985 hit about kids hunting for pirate treasure is a love letter to the power of parent-free play. ASTIN: (As Mikey Walsh) Down here, it's our time. It's our time down here. TURNER: Lewis says in decades past, free play empowered kids, giving them important skills they'd use for the rest of their lives. LEWIS: So they were able to resolve disputes. They planned their time. They managed their games. They had a lot of autonomy, which also feeds self-esteem and mental health. TURNER: These days, though, free play is on the decline, Lewis says, and so are the social and emotional skills that come with it. LEWIS: To build self-control, we need to stop controlling children. TURNER: Part of the problem is parents who worry that unsupervised play is just too risky. But the risk, Lewis says, is part of the point. LEWIS: To have falls and scrapes and tumbles and discover that they're OK, they can survive being hurt. TURNER: In many families, Lewis says, play has also been crowded out by parents' increased focus on academics. William Stixrud is not one of those parents. WILLIAM STIXRUD: When my kids were in elementary school, I said, now, I'm happy to look at your report card, but I don't care that much. I care much more that you work hard to develop yourself. TURNER: Stixrud is a neuropsychologist and co-author of that other new parenting book, "The Self-Driven Child." He says academics are important, but kids have to be in the driver's seat, learning to manage their work, their time, and ideally being able to pursue their own interests. That freedom, he says, helps kids develop internal motivation. Stixrud's daughter Jora, who now has a Ph.D. in economics, still remembers first grade, when she brought a paper home from school. Jora says her parents were supposed to sign it every day, proving she'd read for 15 minutes. JORA LAFONTAINE: He looks at it, and just kind of laughs and just signs every single line on it and said that he did not want to turn reading into homework or a chore. TURNER: When Jora was an A student in high school, she attended a talk her dad gave about why we shouldn't focus on grades. William Stixrud remembers his daughter pushing back that night. Driving home, she said, you know, I liked the lecture, but you don't really believe that stuff about the grades. LAFONTAINE: And so I said to my dad, if you don't get grades, you're not going to get into a college, or at least, you won't get into a good college. TURNER: And if you don't go to a good college, you won't get a good job. LAFONTAINE: So my dad said, I will give you a hundred dollars if you're willing to get a C in one of your classes. And I laughed and said, no way; you don't mean that. STIXRUD: And I told her I absolutely believed it. I believed enough that I offered her a hundred bucks for a C.
STIXRUD: One thing that seems like a disaster - it's just not that big a deal. TURNER: Jora didn't take her dad up on that hundred-dollar offer, but she says it meant a lot, knowing that the only person really pushing her to succeed was her. Cory Turner, NPR News, Washington.